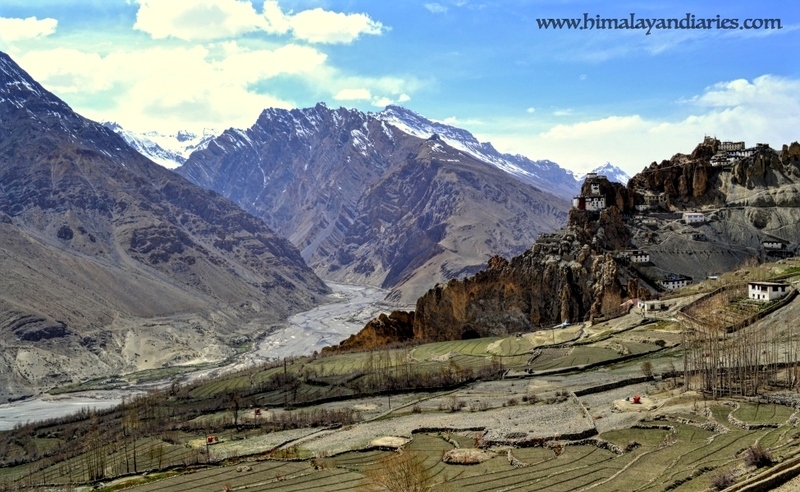 Lahaul and spiti are two remote Himalayan valleys of Himachal Pradesh, lying in the indo Tibet border. They are strange ,exiting and adventurous . Extremely different and beautiful valleys like none other in the entire Himalayas . 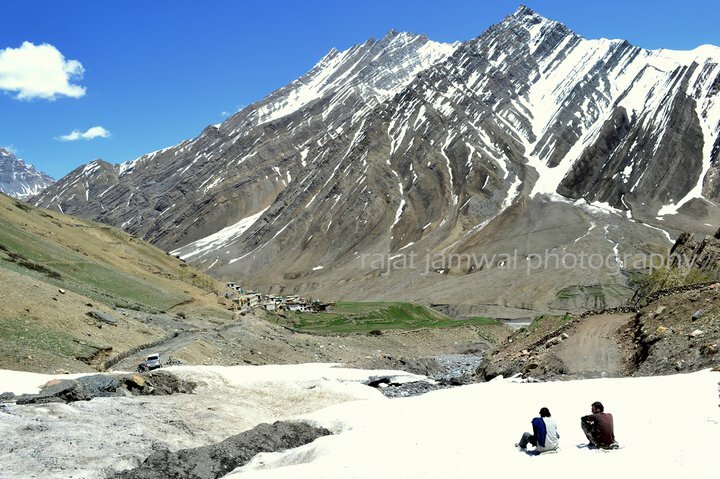 Lahaul has more uniform line of mountains, and thus it has massive glaciers. 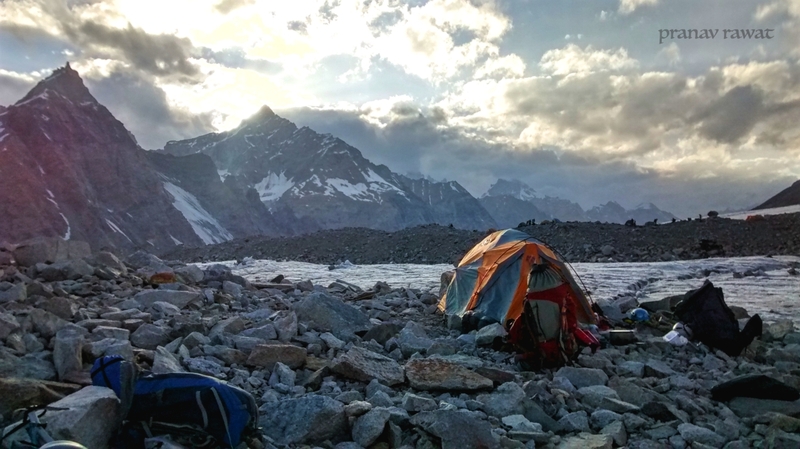 There is little monsoons in both these valleys, this enables climbers and trekkers to enjoy long and unbroken in perectual sunshine to explore the wilderness and grandeur of the inner Himalayas. Since the Valley is situated in the rain shadow area, North of the Pir Panjal ranges, the weather remains pleasant and comfortable during summers, that is May to Sep. If you are new to this area, it is first important to understand the geographical location of this place. 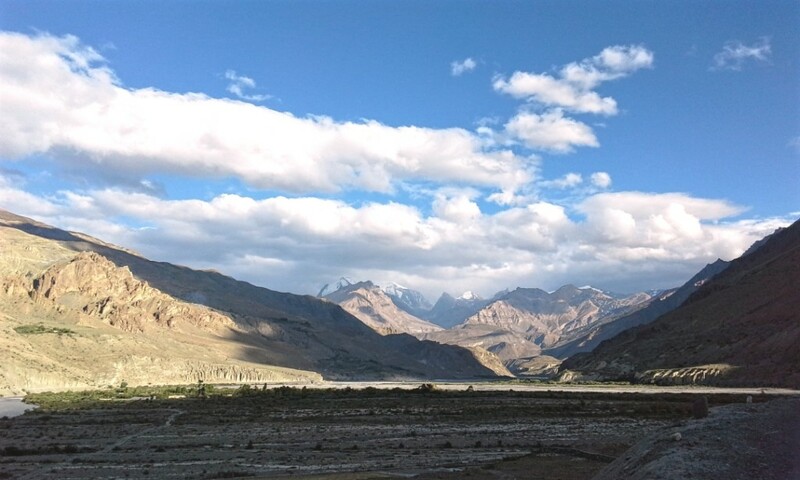 Lahaul and spiti are entirely different valleys, separated by the Chandrabhaga ranges, and connected by the kunzum pass (4550 mts). The headquaters of spiti is in Kaza, and of Lahaul is in Keylong. Spiti is assessable from Kinnaur side too, the main advantage of this route is that there are no high passes to be crossed along this route. Lahaul is the region beyond Rohtang pass.To reach Lahaul ,you have to cross the pass at Rohtang. The road which comes from Spiti, across the Kunzum pass meets at Grampoo, 15 kms from Rohtang. If you turn right from Grampoo , you start your journey towards Spiti across Kunzum pass. The winters are cold and the temperatures plummet to below minus. In December, there are first sign of snow fall, which continue till March. By the end of march the temperatures begain to rise, but there is still an element of chill in the mornings and evenings. The spring season is relatively warm, but you still need woollens. The first signs of summer come in late April. The warmth is because of the Sun. Once if you in shady area you will feel the cold. Areas above 3500 m reamin cold through out. That is if you paln to cross kunzum even in the thick of summers, you still need a jacket. once it is sunny, the months of may to September are warm. In the last week of September, the evenings and mornings start getting cold and the days are pleasant. Only BSNL Network is present in the valley. Most mountain shadow areas are devoid of network. The High villages and Passes are cold even during summers, so keep a warm garment handy. Road blocks can cause delays, so start the day early especially if you have to cross Kunzam. There is a Petrol Pump at Kaza, before that there is one at Powari in Kinnaur. The next one is across the kunzam at Tandi (Lahaul) which is 183 kms, and at Manali across Rohtang which is 200 Kms from here. All of Spiti Valley is electrified, excepting for the camps at Chandrataal and Batal, When visiting Chandrataal make sur to take you batteries fully charged. Avoid going into the rivers for clicking photographs, and dont venture into the high mountains without a proper guide. Foreign Nationals visiting the protected areas of Spiti Valley and Kinnaur Valley are required to get the inner line permits or ILP. Domestic (Indian) tourist do not require any permits. If you are Indian, then just carry a valid photo ID proof of your nationality to be on safe side.The permit is valid for a period of 2 weeks. After you get the permits, make 5-6 copies of it as you will be required to submit them at police checkposts mainly at Jangi and Sumdo. Pin valley is the second biggest river in Spiti. There is a bridge from a place Called Attargu, 10 Kms from Schling. Pin valley is an extremely beautiful place ,marked with numerous glaciers, and breathtaking landscapes. The first of the Pin valley villages is Gulling.2 kms above Gulling is Kungri, where there is the 600 years old Ugyen Sanag Choling Gompa. Then comes Sagnam. Then comes the village of Mud. Mud is the last village of the Pin valley. Mud has a few guest houses, and home stays. Mud is also the road head camp for the famous Pin Parvati trek. If you ever imagined about a fairytale location of a monastery high up in the Himalayas, over looking a dark blue valley and snow capped mountain , then this is the place. Dankar monestry is a small fort like structure built into a mountain. This is an ideal setting for any Himalayan monastery. Dhankar is small village 7 kms from Shichiling. The road goes winding up a hill. There are numerous views of the monastery from the way. Dhankar is a small village with a few houses. Now many have turned into homestays. There is also a Hotel there just opposite the monastery. The Monastery is built out of local material like Mud and stones. the roofs are made in pure Spiti style which has mud plastered on top of planks of wood. There are various small prayer rooms in the monastery and there are open windows so that there is no total darkness. There are various wall paintings that date back to the 15th Century. There is a statue of Vairochana Buddha in one of the rooms. There are also numerous Thankhas that are now in bad shape. This Monastery was built using traditional materials like mud, stone and timber. It is dark inside and small steps are leading from one place to another. To prevent complete darkness, there are small windows in the walls, from where sunlight approaches. There are many prayer hall inside the monastery. In one hall,there is a statue of Vairochana (Dhayan Buddha) consisting of 4 figures seated back to back in addition to various crumbling thangkas.The monastery also contains a series of fifteenth-century wall paintings. Over the years this Monastery has been subject to erosion by wind and the rain. This Monastery has been declared as one of the worlds most endangered sites in the world. The view from top of the monastery of the Spiti river and the snow capped mountains is amazing. In all a travellers and a photographers paradise. Situated onthe right bank of the spiti river. This is the biggest settlement in the ntire Spiti valley. 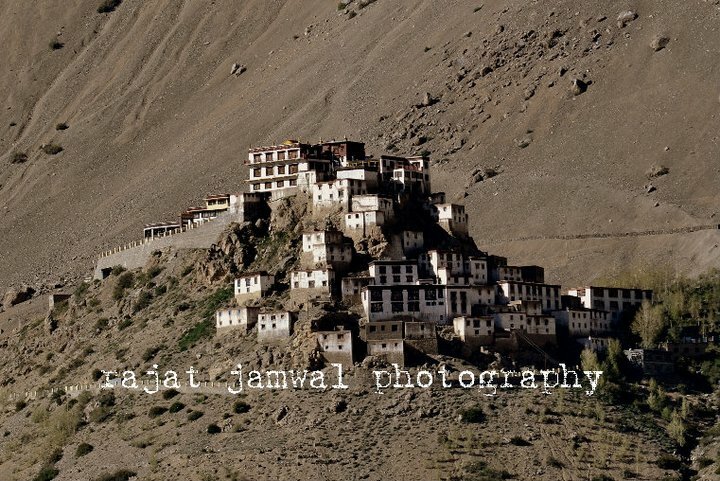 It is the headquater of Spiti. 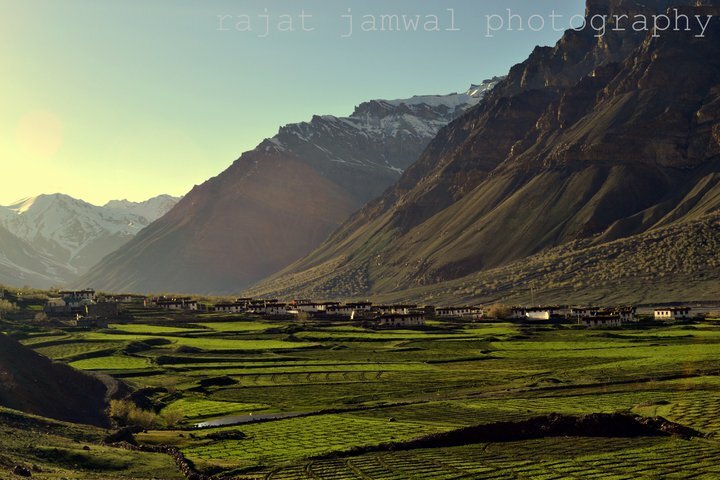 It is the biggest settlement in the entire spiti valley and is the administrative Headquater of Spiti Area. 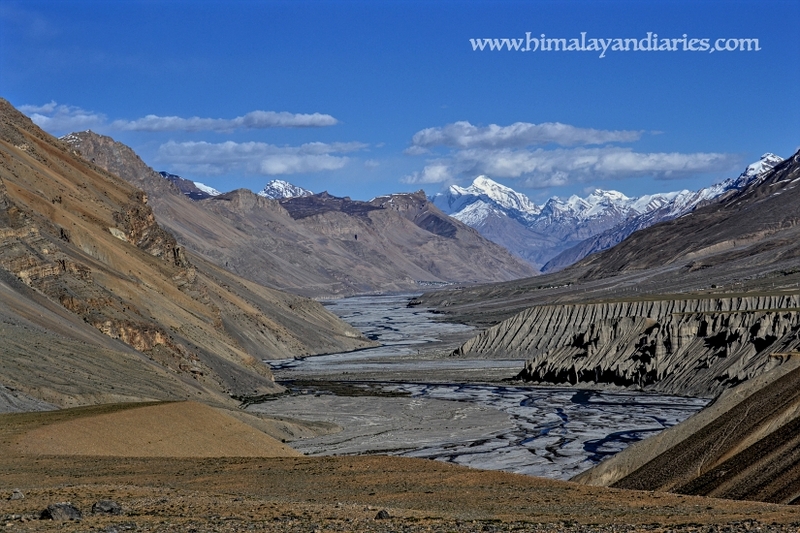 This is a high altitude or cold desert having close similarities to the neighbouring Tibet and Ladakh regions in terms of terrain, climate and the Buddhist culture.Kaza is the base for journeys towards Kunzum and the world famous Chandertaal lake. At A distance of 7 kms from Kaza at an altitude of 4166 mts is the famous Key monestry. 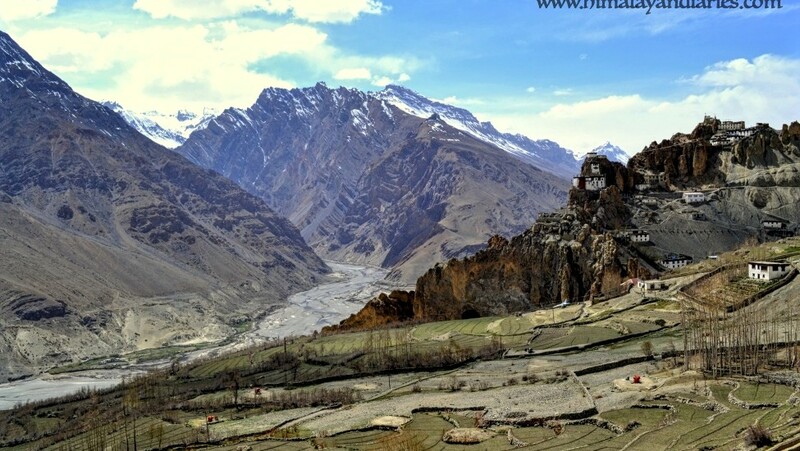 It is situated on a slope overlooking the spiti river. When you drive towards Kunzam on the Highway, After some time there is a bridge on the river, if you take this bridge you go towards kunzum, and if you go right you take the road towards Key. It is built on top of a small hillock mounted on a bigger hill. Its firts look gives it a appearence of a fort. It has three floors, and houses about 150 monks.The monestry belongs to the gelupa sect of buddhism. The top terrace of the monestry has a wonderful view of the green farms and the blue waters of the spiti river. The monastery has some really beautiful scriptures and paintings of Lord Buddha and other gods. The Key gompa is also famous for its priceless collection of ancient thangkas, including Tibetan silk thangkas upto 800 years old and frescoes depicting the life of Padmasambhava. There is a Key Village that comes just before the Key monastery. There is a guest house at Key monastery where you can stay for the night. The views from this vantage point are just breathtaking from where you can also view the land as far as across the Spiti River. 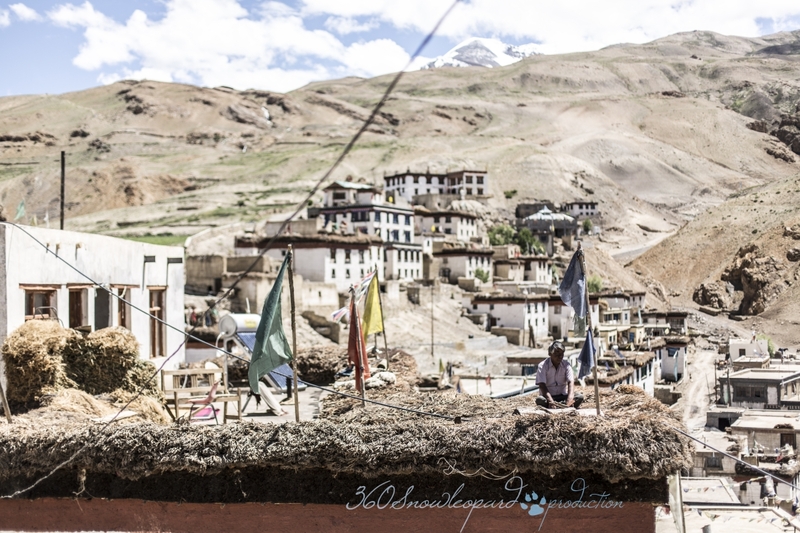 If you continue on the same road ahead of Key Monastery, 16 kms from Kaza is the village of Kibber. All these villages are the highest settlements in the world. Kiber is well connected by road. Infact it has a bus service. It is also the road head camp for the world famous Parangla trek, which is the traditional trade route between Sipiti and Ladakh. 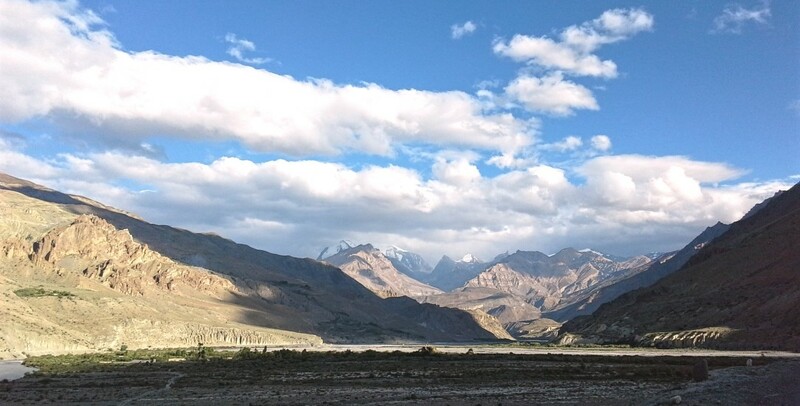 The drive from Key monastery towards Kibber is filled with amazing views of Key and the spiti valley. You can see the entire landscape as far as the Kunzum mountains. During the drive you will get the enchanting vibes of the Buddhist culture of Spiti. The villages have fluttering prayer flags everywhere, and are mostly made of Stones, Mud and Wood. The roofs are made of tree planks laid up against each other in a line and then it is plastered with Mud. Mostly the top of the house is for keeping Fodder and wood. From Kibber there a dirt track which takes you to Gette Village and beyond that Tashigang is final village where one can drive from Kaza on jeep trail. After a mile from Kaza , you take a bridge , which takes you to the right bank of the spiti river. 10 Kms from Kaza is the village of Rangrik. This is a calm and quite place , if you want to be far away from the hustle and bustle of Kaza. Rangrik has a few hotels and guest houses. There are plenty of short walks and treks from this place. 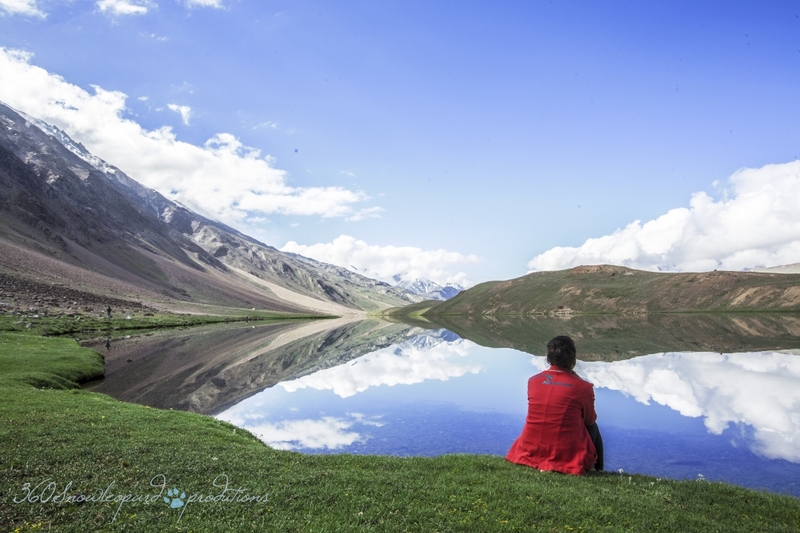 You can just walk down to the spiti river and enjoy its calmness. 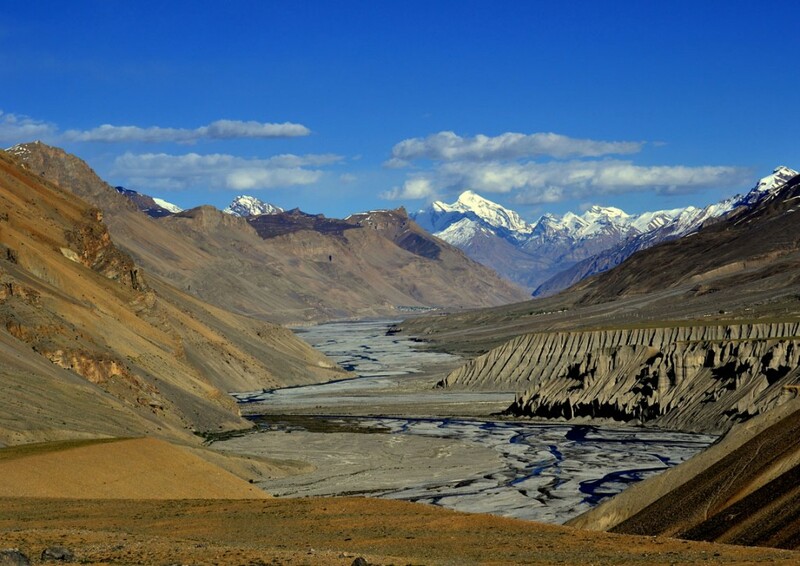 Losar is 56 kms from Kaza, and is the last habitable place , in the spiti valley towards Kunzum pass. It has a few guest houses, and a P.W.D. Rest house. Losar also gains importance , because of its proximity with Chandertaal, the moon lake. Kumzum pass is 20 kms from here. Kunzum , 76 kms from Kaza, is the pass which connects the Spiti and the Lahaul valleys. It is one of the most enchanting and mystical places in the Himalayas . It has a temple and a buddist Gompa in the same compound. From the top one can view the majestic Chandra Bhaga ranges, and the Bara shigri glacier. There is also a trekking route from Kunzum to Chandertaal . The trek is about 10 kms. After crossing Kunzum you enter Lahaul. Lahaual can also be assessed from Manali through the Rohtang pass , on the manali Leh Highway. The Road to kunzum bisects at Gramphoo. If you turn left , while coming from Manali, you take the path to Kaza, across the Kunzum pass. One of the most popular destinations for travelers, especially trekkers. The feeling of being one with the universe is here. Chandertaal is 17 kms from Batal. It is assessable by foot or a jeep. There is also a trekking route from Kunzum Pass, which is 8 kms. The road to Chandertaal cuts 3 kms from Batal towards Kunzum. Chanderataal gets its name from the moon lake. The river Chandra originates from here. Altitude:- The glacier is above 3,950 m altitude and extends beyond 4,570 mts. Bara shigri means big glacier in literal Lahaul language. The snout of this glacier almost ends near the Chandra river. This glacier is a days walk from Batal, across the river Chandra. It is 11 kms long . The glacier is so heavily covered with surface moraine that ice is not visible for long stretches except along the crevices and in the ablation areas. Many mountaineers have trekked it for the sake of hobby or geographical exploration.